This is a good time of year to pick up beautiful, often limited edition, solid fragrances encased in jewel-like offerings. Marc Jacobs' Daisy fragrance doesn't appeal to me personally- I prefer the original scent- but the white floral scent is hugely popular, making it a relatively safe bet for gifts. 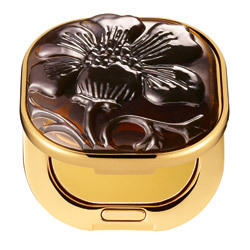 It'd be difficult to go wrong with this solid perfume, presented in a fun flower ring/ necklace. Clinique's bestselling Aromatics Elixir celebrated its 40th anniversary this year and to celebrate, the brand has introduced some stunning, limited edition releases. One of the prettiest is this compact/ necklace which contains a fresher variation on the classic, patchouli laden fragrance. 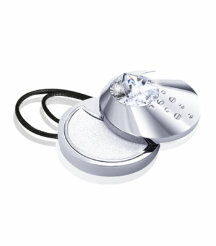 For a chic, wearable option in every sense, try Swarovski Aura which is a softer, powdery fragrance.